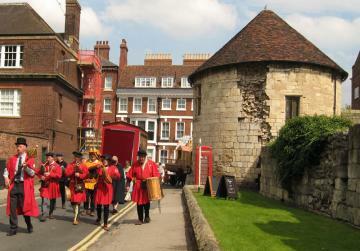 This weekend saw much mystery playing, with both of our local traditions on show and free to view. On Saturday lunchtime, by the Minster, I watched waggon plays. That evening, on my computer screen, I watched the Museum Gardens production, courtesy of a ‘for one night only’ live feed. 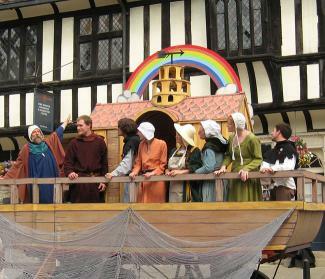 The following day, one of the waggon plays again, on College Green. A memorable event, seeing both productions on the same weekend, being temporarily immersed in mystery plays of such different types. 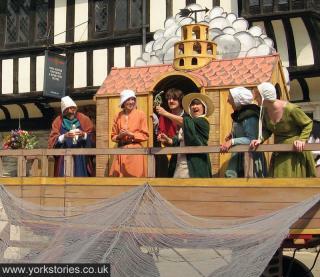 The waggon performances and processions are pictured on this page. 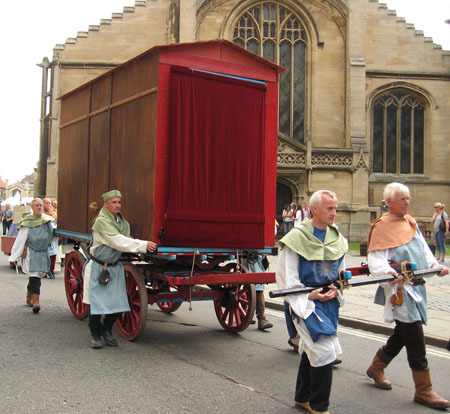 The waggons stationed by the Minster, at the end of Duncombe Place, understandably draw a larger audience from people simply passing by, including visitors to the city. I overheard many comments from interested and often slightly bemused passers-by. One man explained to his wife ‘they’re doing those olde worlde plays’. The processions between the playing stations and back to base provoked the most interest. Partly because of the unusual and haunting medieval music played by the Leeds Waits and York Waits, and partly because it’s not every day you see people in medieval dress and colourful robes walking through the city leading people also in medieval dress pushing a waggon topped with a small stage set. Though I do wonder if many of the tourists passing through from far-flung places, in York just for a brief visit, think we do this every day, or perhaps at least weekly. 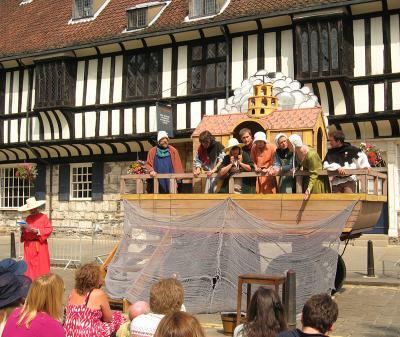 We did of course once stage these waggon plays every year, on the feast of Corpus Christi. That’s the tradition these modern waggon plays refer back to. The medieval waggons used to begin their journey from Toft Green, which was once green, but is now covered in large modern office blocks. Performances went on all day, and were a big community event, involving amateur players, and a jolly and probably increasingly drunken audience. The two plays chosen for this weekend’s ‘mini’ production were the more light-hearted and cheerful ones. Both had animated waggons and amusing props. 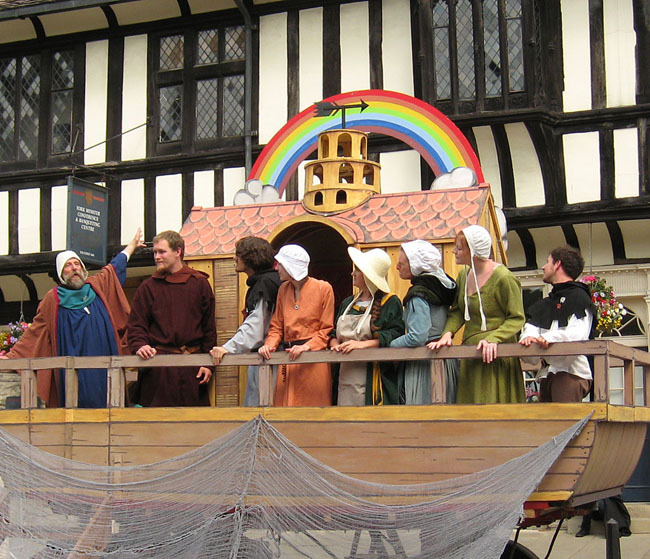 The Noah waggon had a wheeled device which turned a painted cloud into a painted rainbow, and real live birds – a raven, and doves. Previous releases of the lovely white bird had gone well, but at College Green on Sunday the dove sent in search of dry land found it rather more quickly than expected. Instead of the planned disappearance into the distance it flew a short way to a nearby roof just behind the waggon, for a bit of a rest. This was followed by the intended humour of the ‘return’ of the dove, which saw Noah produce and clasp fondly an obviously stuffed non-real dove, complete with olive branch. The audience for the plays wasn’t as big as it could have been, considering this entertainment is provided for free, in the open air. Many potential audience members perhaps feel that the language may be too difficult. These are, after all, even older than Shakespeare’s plays. And between the plays, and afterwards, the procession through the streets, while tourists stand and stare. As do many of the locals, who don’t seem exactly familiar yet with this resurrected tradition. 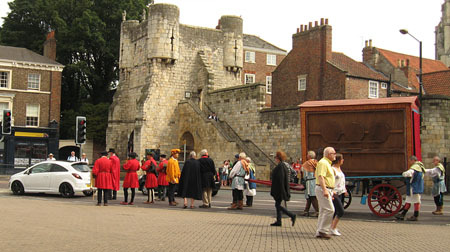 It moved through the traffic, with the procession stopping at the traffic lights, like a rather strange vehicle, before heading off down Bootham and Marygate, still led by the York Waits, playing medieval music. 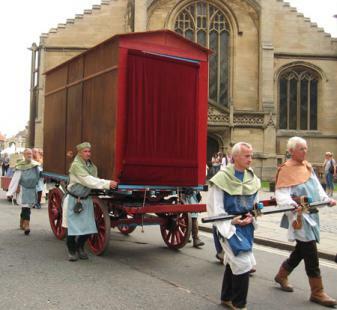 A car heading up Marygate was forced back by the advancing procession of waggons, waits, actors and guild members. Two young men were highly amused and took pictures of one another fooling around, with the waggons and medieval costumes in the background, before the waggons disappeared in a dignified fashion, into the old abbey precinct. No photos of the large-scale production, I’m afraid, though I do have this picture of an amusing sign spotted in the Museum Gardens. It was an interesting experience to go from Saturday’s daytime waggon plays to Saturday night’s brave and innovative live feed of the 2012 production. I’m a bit of a web-head, I love the internet, and get excited by these initiatives which utilise the web in opening up our cultural riches to a wider audience. The much-anticipated fixed-stage production uses ‘modern’ dress, or rather mid 20th century dress. In all other respects it seems even more modern, bang up to date, very much a 21st century production using Twitter and other social media in a confident and skillful way to spread the word. The internet live feed fitted it so well. 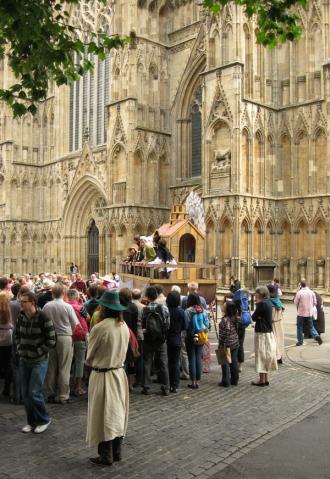 At midday I was standing in the street watching people in medieval costume reading our Mystery Plays right in front of me. At 7.30 that evening I was sitting at the kitchen table at home watching our Mystery Plays on a computer screen. Taking place only ten minutes walk from where I was sitting, but travelling to me digitally over a vast distance, in an instant. I have been more interested in the things ‘around’ the massive Museum Gardens production – the enormous stage built for it, the internet broadcasting of it. It’s all so big and brave and you can’t fail to be wowed. I watched it partly on an iPad and partly on a laptop computer, unsure which screen I preferred. While watching I also looked at the transcript provided on the website (nice touch) and at one point located on the internet a version in the original Middle English. To complete this ‘multimedia extravaganza’ I had a copy of the Purvis translation of the plays, in old-fashioned library book format, propped up on the kitchen table. It is very long. I thought it had been going on ages and then realised Christ hadn’t even been born yet. I got distracted, like a proper 21st-century Twitter-obsessed web-head, and started tweeting about it rather than watching it. The abiding impression of the two productions, in my ‘compare and contrast’ viewing exercise, was that the fixed stage production is visually spectacular, very grand, and very serious. The bloodiness and suffering of the crucifixion was expertly portrayed, difficult to watch, and deeply moving. 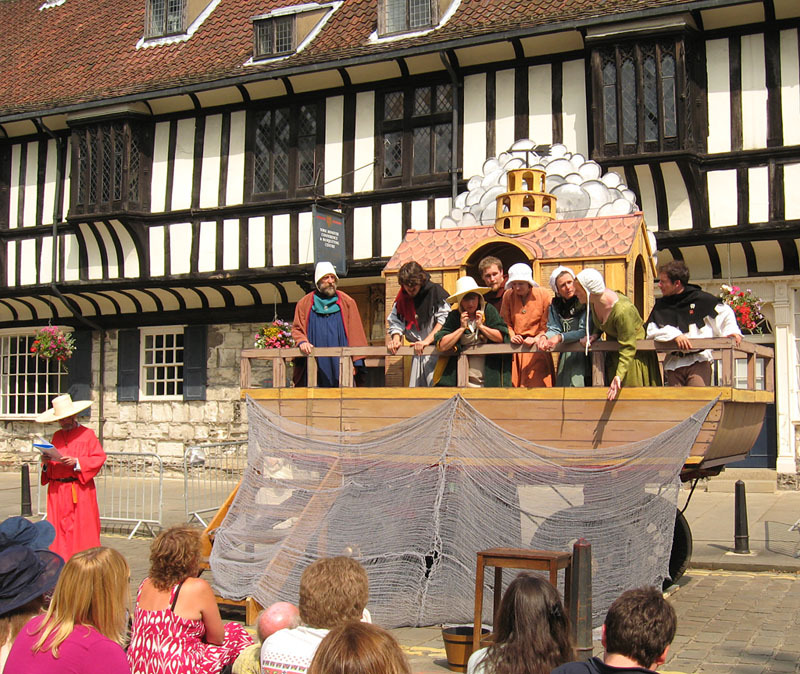 Noah and the flood looked stunning on the Museum Gardens stage, but was an entirely different thing, without the charm and humour of the version I’d seen earlier. And their dove wasn’t as good. I felt very privileged, being able to see both versions of our plays on the same day. (Anyone following me on Twitter would have been aware of this, and possibly rather bored by my repetitive tweeting about it.) 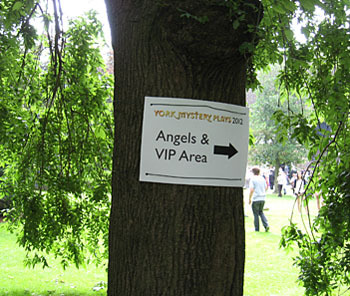 It also clarified the claims of the two traditions, which have the same title – the York Mystery Plays – but are two entirely different creatures. Watching the Museum Gardens production I lost any sense of connection with our medieval past, despite the abbey ruins in the background. I was watching bible stories, beautifully realised, involving hundreds of people, in a truly impressive production. But these were scripts plucked from the setting they were intended for, restaged for the 21st century. I know that many people see the fixed-stage productions as the ‘real’ mystery plays, and I’ve had a heated debate on the subject with a friend who had that view. 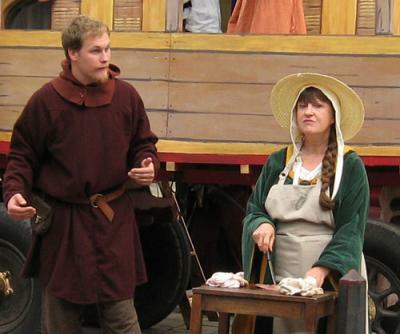 I know that many are equally passionate about the more ‘authentic’ waggon plays – I’m still one of them. The Last Judgement is the play I remember the most. Always visually spectacular when performed in the guilds’ waggon productions, then and now. You’ll probably have to wait until 2014 to see it performed again on waggons, for free, in the open air in the city streets. Its language is so beautiful, and perhaps best presented by someone standing on a waggon speaking directly to a small crowd. 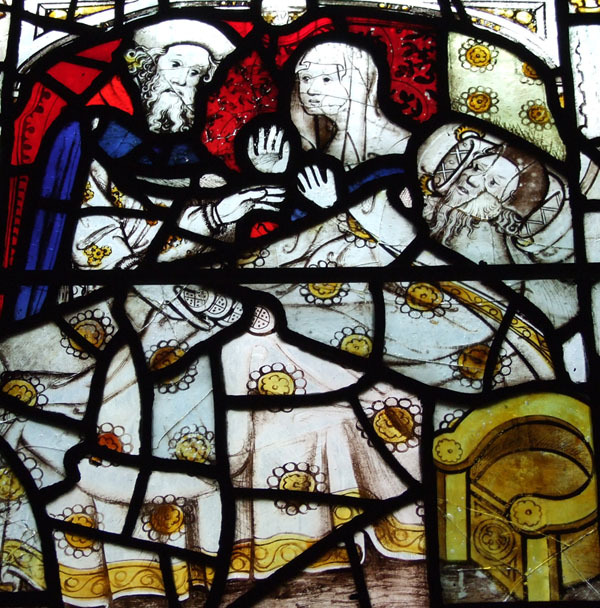 Here’s just a bit of it, accompanied by a photo from one of our city’s medieval stained glass windows, in All Saints Church, North St. This is the world the waggon plays bring back to us. To slake my thirst your heart was free. Ye would no sorrow upon me see. Kindly ye come to comfort me.